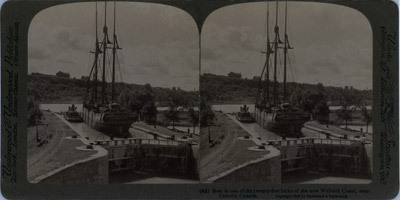 Stereoview of the tug A. D. CROSS and the schooner ARTHUR of TORONTO in the third Welland Canal. This is the published view of a series of pictures of this passage of the CROSS and ARTHUR that survive in the Keystone View Company archives. (43) Boat in one of the twenty-five locks of the new Welland Canal, near Thorold, Canada. Arlington, N.J. Littletn, N. n. Washington D.C.
"The gates at this side of the lock were first opened to let the water through and so equalize the level of this part of the canal and of the lock, allowing the vessel to pass in. Now you see the vessel within the lock; the opening of the farther gate is admitting the waters of that farther section of the Canal so as to equalize these two levels, allowing the tug and the vessel to pass out of the lock into the waters beyond, on their way from Lake Ontario up to Lake Erie. There are twenty-five of these locks in the twenty-seven miles between Port Dalhousie on Lake Ontario and Port Colborne on Lake Erie. There is a difference of nearly three hundred and twenty-seven feet between the levels of the two lakes, but the twenty-five locks make the passage perfectly feasible for vessels of 1500 tonnage. The canal is one hundred feet wide and has a fourteen-foot depth of water. Niagara River and the Falls are eight miles away to the east. Until this canal was constructed, the Falls cut off all navigation, but now it would be feasible for a vessel to make a continuous journey from Duluth at the far western end of Lake Superior down through the Gulf of St. Lawrence to the open sea. The freight that actually does pass through this very lock amounts in a single year to 1,150,000 tons. Frm Descriptive Bulletin No. 4, copyrighted, 1904, by Underwood & Underwood.